Apple Inc. is changing, and everyone knows it except Apple itself. Apple executives consistently fail to be straightforward about significant technology trends and how they affect the company. The biggest of the big trends: Growth in the smartphone market is gone, at least for now. The likeliest buyers now own at least one of the devices. Smartphone owners are holding onto their devices for longer than they used to before buying newer models. In many countries, people have divided into iPhone or Android camps, and there’s not much defection. ground to a halt globally, and Apple isn’t immune. Investors know this. 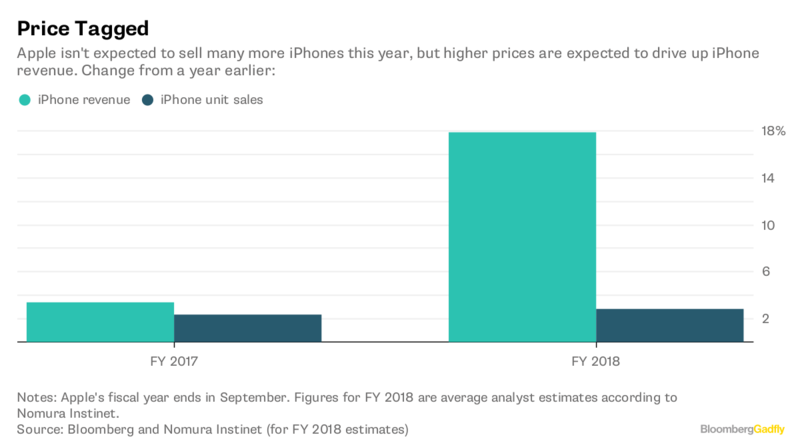 Analysts on average expect Apple to sell 3 percent more smartphones in the current fiscal year than it did in 2017, and they’re forecasting a 1 percent bump in fiscal 2019. That slow growth isn’t great for Apple’s business, although the company’s revenue is expected to grow more quickly this year thanks to price increases and new products. 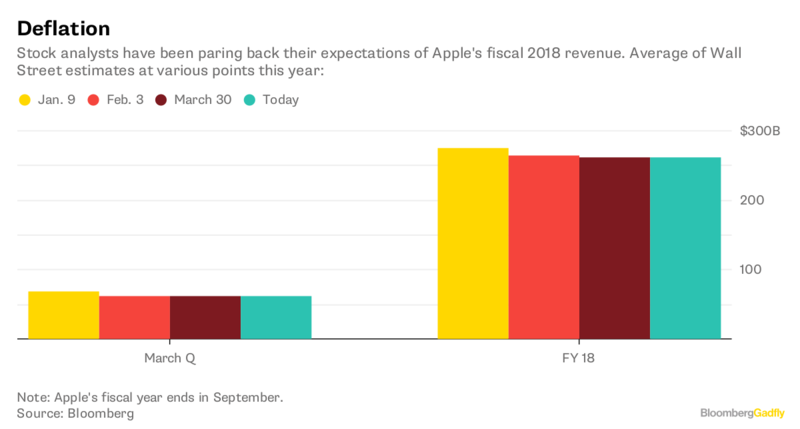 Ahead of Apple’s fiscal second-quarter earnings report on May 1, analysts have been paring back their forecasts. They did a similar paring exercise, presciently, ahead of the company’s December quarter earnings. It’s time for Apple to stop being polite and start getting real. The reality is that the easy growth is over for the iPhone, which generates the majority of Apple’s revenue. The company can pick up some of the slack by charging higher prices, releasing more products to gin up fresh sales and squeezing more money from Apple device owners through music and news subscriptions, app downloads and more. But there’s risk and uncertainty — and also potential — in Apple changing the foundation of its business model. The company’s stock price most likely doesn’t reflect the possible downsides now that shares are as expensive as they historically get. That’s a pessimistic paragraph about Apple, but it has the virtue of being true. Apple executives, by contrast, prefer to brush off the facts about broad changes in the smartphone market or how Apple is changing to reflect this new reality. In an August conference call with stock analysts, one of them asked Apple CEO Tim Cook whether the company could continue to sell more iPhones in a few years in light of the smartphone market’s stagnation. Cook said he thought Apple could sell more phones to people who already own iPhones, to those who have competing devices and to people who have never owned a smartphone before. It was an answer straight out of 2015, when everything Cook said was true. It’s not true anymore, and the Wall Street outlook for iPhone unit sales shows that investors don’t believe what Cook said. IDC estimates that smartphone sales dipped 0.5 percent in 2017, and the research firm expects a compound annual growth rate of 2.8 percent in the next five years. One reason for this stagnation is that people in many countries are taking longer to replace older phones. Apple is not upfront about the change in the market. Cook did say in a February call with analysts that in some countries people have been taking longer between new phone purchases. But he also said this rate of smartphone upgrades wasn’t “something that we overly fixate on.” That’s a stunning answer considering that Apple sells the majority of new iPhones to people who already own one, and that makes the company’s sales highly sensitive to how often those iPhone owners are trading up to newer models. Apple privately must realize smartphone winds are no longer blowing at its back. That’s why the company has been stressing the size of its “installed base,” or the number of Apple devices in use around the world. That number is 1.3 billion, the company said in February. 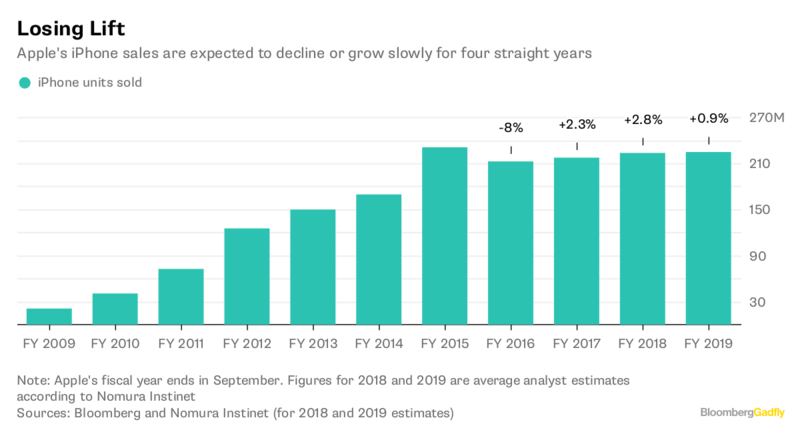 By stressing this figure, Apple can steer investors away from stuttering growth in iPhone unit sales and get them excited about the financial potential from persuading existing Apple device owners to buy more apps, subscriptions to current and future Apple products, add-on gadgets like the HomePod and more. It would be smart if Apple explained why the installed base matters, how the company plans to squeeze more money from those device owners and how its financial profile changes if it’s reducing its reliance on iPhone sales. Maybe it’s not the job of corporate executives to issue truth bombs like, “We’re trying to offset natural stagnation in our biggest market,” but it would be refreshing and help give Apple more time to land on its next big product categories, whether it’s electric cars or something else. Apple is doing smart things to extend its iPhone franchise by adding ancillary products and finding ways to dial up smartphone prices. This is a savvy strategy, which makes it all the more odd that Apple won’t talk about it.